This light designed by Nelson Sepudelva for Ay Illuminate reminds me a bit of the spirit of the Koushi XXL pendant light (with Coton Kandhi, 350 €) by Mark Eden Schooley I fell in love with at MERCI in Paris. Beautiful find! 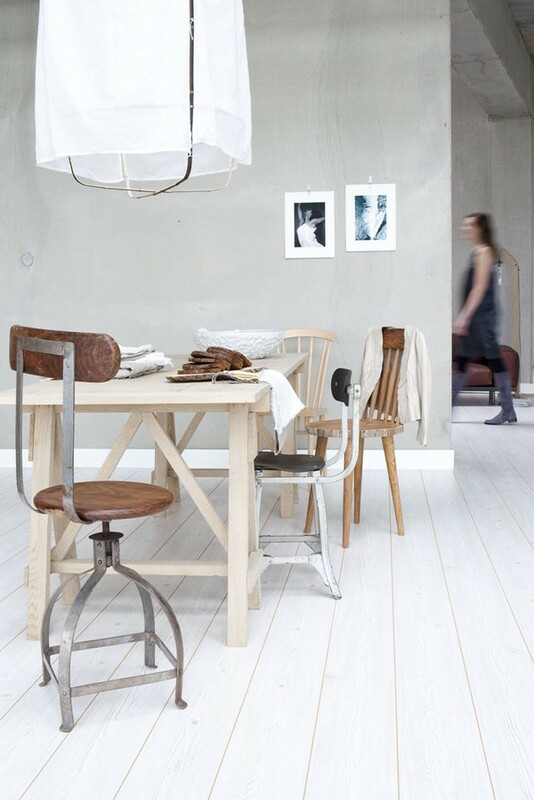 I love the softness and relaxed feeling of the space with the details of a loose cotton pendant (love to see this at night), mix & match industrial chairs and casual hanging photography. It ties in the lovely elements of a chic vintage laundry mat. BTW This week I will be walking around in the house the makers of this magazine *VT Wonen* that is my favorite all time magazine ;)build at the annual interior exhibition in the Netherlands.. come over and have a look at it! PS The Paoala navona link is not going anywhere.. I would like to see the ‘real’ one of her. I think I fixed the link…It was a page about Paola’s words of wisdom I thought in the Sunday times (I think) and the pics of her lights I took when I went to Paris. You perfectly captured the atmosphere of this room…I had a look at your website, you have some gorgeous pieces on it! on aimerait que ce soit chez nous!!! I thought exactly the same thing when I saw this photo … I really do dream of having the real Navona …. I remember those Merci shots !!! Yes it is fixed ;) great lamps of Paola to! The floor here is thenew floor Lodge kalk from the VT wonen collection.. I am anxious to see it inthe house,, it looks a lot like my own white floor. Previous PostHappy thoughts for the weekend….